Looking for tips for those first 30 days after a cat adoption? Here is everything you need to know, from what to buy to how to prepare your home! You’ve been to the humane society or your local animal rescue, and decided to bring home a new feline family member. First of all, congratulations! Second of all, are you ready for this? Do they have their own bedroom? Gold-plated dishes? Self-cleaning litter box? They do need all of this stuff, correct? Okay, maybe not. There are basics you will need, for sure, but you don’t have to break the bank to do it. Below are nine essential tips that you need to know for the first month after your cat adoption! Never Miss a Purrr-fect News! Nor A Discount! What you need to buy…and why! Affiliate links included below. If you make a purchase, we earn a commission at no extra cost to you. It’s best to go simple and inexpensive to start, because cats have different preferences for their toileting needs, and you may find your cat will not use a covered box (or will only use one), or that they need one with high sides (or won’t put the effort into using one). It may take a few tries to sort this out, so be patient and start with the least costly one that will suit both you and hopefully your cat. You may have to try different litter box locations and different types of litters as well before everyone is fully satisfied. In addition, if you have other cats, you will still need a new litter box. The general rule of thumb is that you should have one box per cat plus one extra (this may require some strategy in a multi-cat household – nobody wants to see litter boxes everywhere they look – but it is often more doable than you might think). Get your new addition a variety of toys to play with, but again, keep them simple. For now, you are trying to figure out what interest them. Get something with a bell, some sort of “fishing” toy, and something to try fetch with (for some reason, I have always had far better luck getting my cats to play fetch than my dogs). Cats can be funny when it comes to toys! Growing up, I had a cat whose favourite toy was crumpled tinfoil from the evening meal (I don’t know that I would recommend this one now, but we didn’t know any better at the time). I have one cat now who will only play with small “crinkle balls ” – which are hard to find in stores (Amazon has a ton of them, though)- and another who won’t play with anything but cheap little plastic springs that come about 12 to a pack. I have discovered though that my own cats also like crocheted yarn cat toys, and there is a great deal of joy in making something for your pet to play with. These don’t have to be anything special – simple cereal bowls will work for now if it’s more convenient for you. Make sure to put some distance between your cat’s water and food dishes, as cats inherently drink less from water located near a food source. This dates back to their wild days when water near scavenged food would often be contaminated. 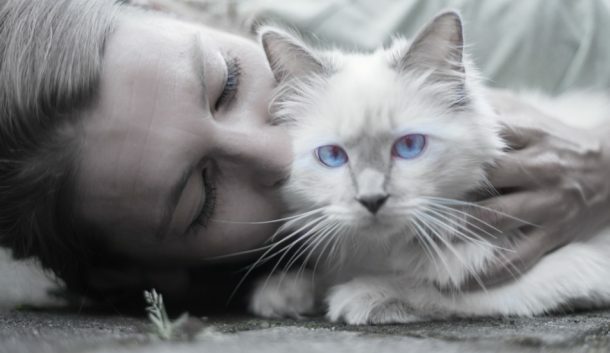 To avoid frustration – for both you and your cat – you will need something they are allowed to scratch. Cat trees are great because they allow for climbing or napping as well as scratching. Catnip sprays are available to help attract your cat to the post, and if you catch them scratching elsewhere, you can gently relocate them and place their paws where you would like them to scratch. 5– I would wait to purchase a bed. Set up blankets or towels in a few places around the house to see where they might prefer to nap. Some cats won’t use a bed, but like to lay on a window ledge or a perch. You can find a bed or a platform, or – as above – a cat tree once you have determined their preference. If you’re looking for DIY ideas, check out these clever upcycled cat beds to try! 6- If you have other cats, introduce them gradually. I’ve had a great deal of luck with placing an item that smells like my established cats with the new arrival and taking an item from the new cat’s crate to place somewhere the other cats will encounter it. I also let them approach each other through a closed door for a couple of days before fully allowing them to meet. RELATED: Are you getting a third cat? Read our guide. 7- Book a vet appointment. This is especially crucial if you have other cats, to protect them and the newcomer from any communicable illnesses. Often rescued cats will come with a free trial of pet insurance, which will likely cover anything that needs medical attention within the first month or two. Get a FREE quote from Embrace Pet Insurance. – your vet should be able to do this at an early appointment. Cats are horrible with collars – they break them, lose them, etc., and without an ID tag, the chances of them finding their way home should they ever get out are slim. Microchips are wonderful because they don’t get lost. 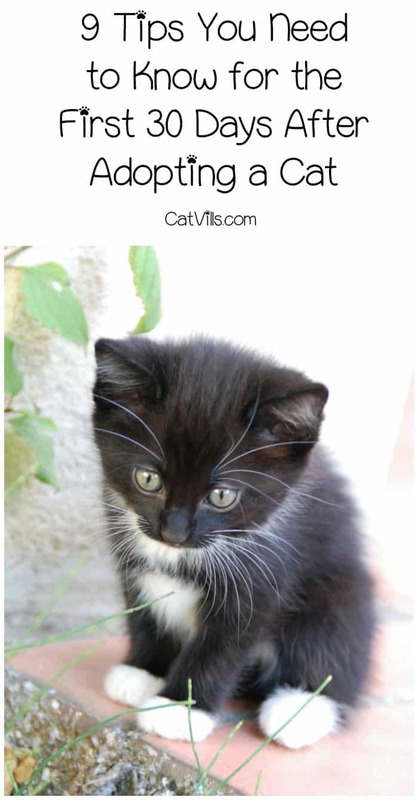 9- If your kitten vanishes and you know there’s no chance he got outside, do not panic! Kittens (and even adult cats) hide in the weirdest places, especially when they’re new to a home and still a bit freaked out. Just back off and give him a chance to come out on his own. He’ll get hungry or need to use the litter box eventually! Enjoy your new pet! You have made a great choice, and you can let them show you why. Do you have any other advice for the first 30 days after cat adoption? Share below! We’ve had our adopted cat for 10+ years. He has been a joy to have and we would do it again. We don’t have a cat and I don’t think we will have one because our dog is a jealous dog. He believes he is the alpha male in our house! I will share your post with my friend at work. He has three beautiful cats and may want to adopt more. Catvills is a participant in the Amazon Services LLC Associates Program, an affiliate advertising program designed to provide a means for sites to earn advertising fees by advertising and linking to (“Catvills” (amazon.com, or endless.com, MYHABIT.com, SmallParts.com, or AmazonWireless.com).